This is a game-changer for children with autism. Brayden Deely’s parents never thought they would be able to get a traditional Santa picture over the holidays. Not because their 6-year-old was scared of Old Saint Nick. Brayden, like thousands of other children, has autism. Fortunately, in 2015 the Deelys learned about the Caring Santa Program, which is offered by Autism Speaks. “This was our only way. We wouldn’t get traditional Santa pictures otherwise. For years we didn’t because it was too much for Brayden,” Brayden’s mother, Erin, told Today. For children with autism, a busy environment can often feel hostile. Imagine being in line for Santa with dozens of other families, crying children, Christmas carols booming and cameras flashing. That’s overwhelming to anyone—and all of those sensory elements can be too much for a child with autism to process. The Caring Santa Program takes away the triggers that can prompt a child’s senses to go into overdrive. Instead, they meet Santa on their own terms in a comfortable and calm environment. According to Autism Speaks, children with autism or other special needs can meet a sensory-friendly Santa in 45 U.S. states and Puerto Rico. 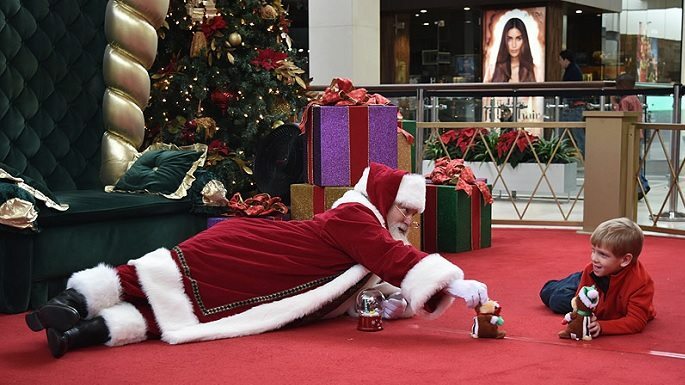 Autism Speaks has a list of all the malls where the Caring Santa Program is available. Make sure to reserve a spot as soon as possible, or include the program in your holiday plans for next year. For Brayden, it took Santa crawling on the floor with a musical snow globe for the boy to warm up. Santa practiced patience, which is sometimes all a child needs to enjoy this holiday rite of passage. One in 68 kids in the U.S. has autism, according the Centers for Disease Control and Prevention. Learn more about the early signs of autism in babies and toddlers.